Trump’s candidacy and the resultant panic it has inspired has sparked an unexpected and remarkable surge in some businesses not only in the United States, but also in its neighbors. A cozy, ready-made bomb shelter. They became a boom industry with the success of the Trump campaign. Realtors in Canada and Mexico are singing Trump’s praises. Their business is booming as hordes of U.S. citizens are purchasing cabins in the Canadian Northwest and modest homes in isolated villages in Mexico where they plan to hole-up until Trump is out of office. In preparation for people “living off the land” for the duration, Whole Foods has opened a “Farmers’ University” to teach organic gardening skills to those whose only acquaintance with vegetables was rifling through the store’s produce department. Backyards and basements are filled with the cheeping sounds of dozens of fuzzy baby chicks people are raising to provide food and eggs in their new home far away from home. For those whose hunting experience has been limited to using search engines on the internet, the Canadian government has set up hunting academies to teach techies how to bring down dinner. However, they haven’t figured out what to do with vegans yet. 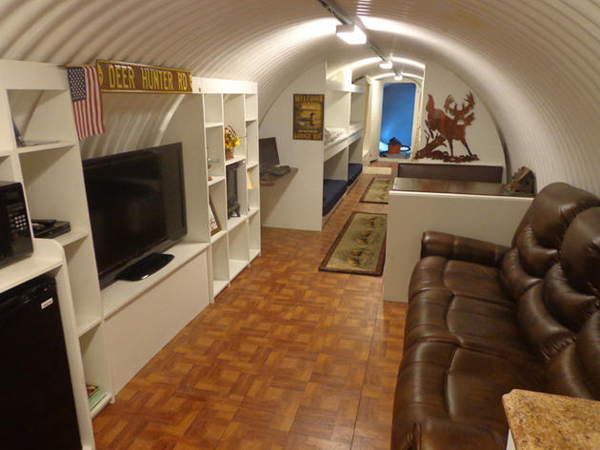 In the U.S., there has been a boom in a brand new industry, ready-made bomb shelters and bunkers for those who want to prepare for the nuclear fiasco they feel is inevitable if Trump becomes president. “We can’t keep up with the demand, especially the closer it gets to November. People are panicking, and it’s become a bidding war over our inventory,” says newly prosperous entrepreneur Joe Bunker. In keeping with the Trump ethic, Bunker said he has raised the prices five times since the beginning of Trump’s campaign. When told that our investigation has discovered that most of his clientele have to take out a mortgage on their present homes to cover the cost and installation, he just grins.